Assigned to the 14th Air Force, 308th Bombardment Group, 374th Bombardment Squadron. No known nickname or nose art. When lost, engines 1830-65 serial numbers BP-425911, BP-425446, BP-425256 and BP-425237. Weapon serial numbers were not noted in Missing Air Crew Report 1205 (MACR 1205). On November 27, 1943 took off from Panagarh Airfield in India on a course of 140° on a bombing mission Insein north of Rangoon in Burma. The weather was clear. About forty minutes from Insein, this B-24 apparently under complete control, left the formation and was observed to proceed in a northeasterly direction into the interior of Burma. Last observed at 12:05 at roughly Lat 18° 10' N Long 94° 38' E. The circumstance of the loss for the aircraft are unknown. "I saw B-24J 42-73312 peel off and drop its landing gear at the same time our flight leader Lt. Gurtis did. He then pulled his gear back up and came back up into formation on our height. He was about 40 minutes from the target when he again peeled off to the right and came back under our ship going to our left at about 90 degrees to us. We had a heading of 140 degrees at that time. His engines were all running O. K. and the ship seemed to be under complete control. I watched him about 300 yards out and he was keeping the same heading." In fact, this B-24 experienced engine trouble and the entire crew bailed out. Also lost was B-24J "Maxwell House III" 412-73245. No search was conducted for the missing plane. The entire crew of ten were captured and became Prisoners Of War (POW). Afterwards, all were transported to Rangoon. They were imprisoned and interrogated at Rangoon POW Camp. 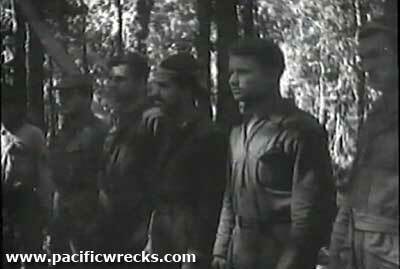 Their captured was filmed by the Japanese and later broadcast as part of Nippon News. The report further indicates the crew were captured and became Prisoners Of War (POW). "According to the Japanese, the B-24 developed engine problems over Burma and that the entire crew parachuted and were filmed by the Japanese. Later, this film was broadcast as part of Nippon News. 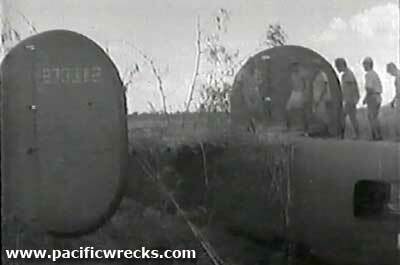 The film shows the B-24 crash landed, as if it might have force landed. The wreckage is camouflaged with branches and shrubs, by either the American crew or the Japanese to hide the wreckage and being nspected by Japanese Army soldiers. Also the captured crew is shown being interrogated." The crew languisted in Rangoon Central Jail. On August 18, 1944 Albinson died from malnutrition, beri beri and dysentery. The other nine crew members survived the war and were liberated on May 4, 1945 including Kellam, Schwall, Harmon, Marshall, Seneef, Perry, Albinson, Thomas and Davis. Afterwards, they were transported to the United States. Postwar, Marcelio was based at Stewart Field, Newburgh NY. Pilot Kellam was living in Syracuse, NY. Albinson was officially declared dead on August 18, 1944. His remains were not recovered and he remains listedas Missing In Action (MIA). He is memorialized on the tablets of the missing at Manila American Cemetery.